This is probably the most common type of hot tub and consist of a water-filled, acrylic shell that is then supported by a steel or wooden sub-frame, which contains the tub's pumps, heater, control system and other anciliary devices. Attached to the frame is either real or synthetic wood cladding, to form a sealed enclosure or 'cabinet' around the shell. 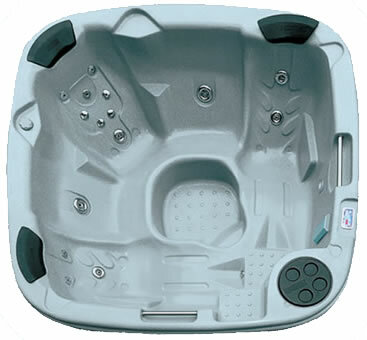 Hot tub shells are contoured in many different ways to provide a variety of different seating positions with massage jets strategically placed to give different massaging effects. The shell is also available in a variety of different colours, which can then be matched with a choice of cabinet colour/style depending on the buyer's taste. Acrylic hot tubs come in all shapes and sizes. From single massage pump, 2-seater rectangular or oval style, to massive 8 or 10 seaters that feature multiple pumps and seating positions. Relatively newer types of hot tub that are now available on the market and are much longer and deeper than the norm are called 'swim-spas. Swim-spas feature a single, powerful jet at one end of the spa for the user to swim against and may also have a separate area or zone with contoured seating for more traditional bathing. Acrylic hot tubs can have different types of thermal insulation material applied to the underside of the shell in order to minimise heat loss and keep running costs as low as possible. Spray on foam, bubble wrap, silver foil reflective blankets are all types of insulation that can be used. Some manufacturers often use a combination of all three methods of insulation to keep the heat in. To further assist the heat retention, some of the better hot tub manufacturers also apply additional foam or heat reflective material to the internal facing wall of the hot tub's cabinet. Acrylic hot tubs are almost always electrically powered to provide water heating, circulation/filtration and massage jet pumps. Depending on the heater rating and the number of water pumps fitted means that the electrical supply to the hot tub can be anything from 13 to 40 amps. Installation of an acrylic hot tub is nearly always carried out by a specialist. They are cumbersome and heavy to move and may also require a dedicated and fused electrical supply to hook up to. Acrylic hot tubs can range in price from £2000 to over £20000 depending on size and specification. These are the more traditional types of hot tub that tend to be predominantly circular in shape and made from Cedar wood. They can feature a simple wooden bench seat that the user sits on when in the water. Cedar, although light in weight, is one of nature's most durable timbers. Its fibres contain a compound called thujaplicin, a natural preservative that is toxic to decay-causing insects and fungi. It is these compounds that give the wood the distinct but subtle aroma, so pleasantly noticeable when wet. Fallen cedar trees in forests will last many decades before decaying fully. Because it is straight grained and uniformly textured, cedar is less likely to warp and twist than other woods, especially so as we only select knot-free heart wood. The low density coupled with millions of tiny air spaces makes cedar an unrivalled insulator. For those in the know, its R value is 1.35 per inch of thickness and it has a thermal conductivity factor K of 0.74 BTU in/ft2hF, far superior to stone, concrete and brick. This is extremely important in keeping running costs to a minimum. It is because of these excellent properties that cedar has been used for centuries to make shingles for houses, window frames, boats and canoes, poles and posts. It can even be used to make rope and clothing and has medicinal powers also. Cedar hot tubs consist of a series of staves (side pieces), which are individually machined to a high standard with a profile that mean they all lock into one another. Stainless steel bands are then forced around the outside the tub, these force all the staves in close to each other to close up the gaps. The equipment used to filter and heat the water in the tub is contained in a separate enclosure normally situated next it and, in most cases, forms a step for the user to climb onto to ease entering and exiting the water. The tub's water can either be heated electrically or with a wood-burning stove. Due to the modular nature of their construction, wooden hot tubs can be supplied in 'flat-pack' form for the customer to assemble and self-install. However, like acrylic spas they may also require a dedicated and fused electrical supply to hook up to. Cedar hot tubs can range in price from £6000 to over £10000 depending on size and specification.